For those of you who aren’t familiar with Jane Austen’s Emma, it follows the story of a pretty young woman named Emma Woodhouse who can’t help but play matchmaker to those around her (the 1995 movie Clueless is a very loose adaptation of it, actually). Having sworn off the idea of marriage for herself, Emma take great pride in her ability to read others and help them in their quests for true love. Of course, not everything goes as Emma plans, and when things don’t go quite her way she learns that sometimes it is best to not meddle in other people’s affairs and to find out what she actually wants for herself. I was a little wary of this book at first because I have found that most classic novel to graphic novel adaptations can be a little… well, not very pretty. Thankfully I was wrong about this; the artwork was fantastic! Everything flowed smoothly and I only found myself staring uncertainly at a few of the pictures (some of the men had huge shoulders and tiny heads… but I might just be nitpicking). I found myself racing through my copy and was actually sad to see that I was coming to the end of the story. This would be a great way to jump into Emma for those who find it hard to follow along with the language of Jane Austen. The artwork was so cute and the story and langue flowed in a way that made this a quick and easy read. 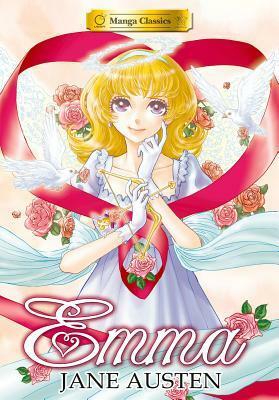 I think I’ll have to dust off my old copy of Emma to visit these characters again!